Please enjoy a selected sample of my writing, editing, illustration and publishing projects. Journey’s End: Death, Dying, and the End of Life by Victoria Brewster and Julie Saeger Nierenberg, 2017. In Journey’s End, multiple personal, professional, and societal perspectives provide valuable insights. We compiled these many and varied quotes, chapters, and resources to serve as a tool for death and dying education, professional training, and grief and bereavement support. Ideal for anyone who will experience death and dying, the book’s intended readership includes, whether now or in the future, everyone. We attempt to describe real life issues and circumstances, and we discuss ways to proactively deal with them. Death, dying, and end of life are topics many prefer to avoid. 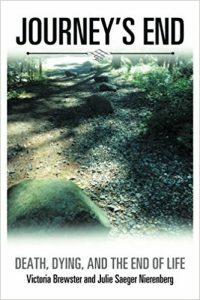 This book suggests that we benefit from having frank discussions and planning for our own journey’s end, whenever that may be. Everyone who is born eventually will die, whether or not we want to embrace that fact. Though few of us know when we will die, we and our family or friends can be well prepared. We can have discussions and create written directives for what we want, if we are unable to verbally state them ourselves. Do we want life support? Do we want interventions that may or may not have any benefit to our quality of life if we are in the hospital or in an accident? Do we want to be involved in planning our funeral, memorial, or celebration of life? Journey’s End is a broadly comprehensive book about death, dying, and the end of life. Daddy, this is it. 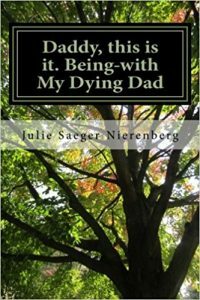 Being-with My Dying Dad by Julie Saeger Nierenberg, 2013. My father lived an inspiring End of Life. He faced metastatic cancer by living fully for the rest of his days. Time and again, his doctors preserved the human body where the tumors grew, until there was nothing more they could do to prevent the inevitable. But Dad felt full of life and longing to live. With courage and amazing grace, he lovingly prepared our family for his passing. As our time together came to an end, I was grateful to be present. Although death is an inevitable part of life, how we choose to be-with the dying and the bereaved is up to us. Being ready to be-with is a wonderful way to live. 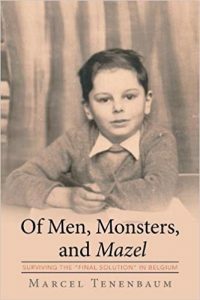 Of Men, Monsters and Mazel: Surviving the ‘Final Solution’ in Belgium by Marcel Tenenbaum, edited by Julie Saeger Nierenberg, 2016. A child survivor of the Holocaust, who lived through the German occupation of Belgium between May 1940 and September 1944, Tenenbaum and his parents went into hiding when the Nazis started deporting Jews to Auschwitz. They arrived at the Malines gathering camp seventy-two hours after the last train for Auschwitz departed from Belgium. 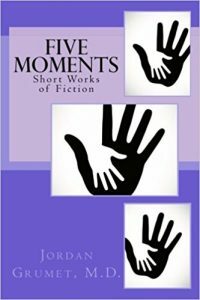 The Five Moments: Short Works of Fiction by Jordan Grumet, M.D., edited by Julie Saeger Nierenberg, 2017. Profound and moving insights presented in a captivating storytelling approach. Grumet is an excellent doctor; he is also a warm and caring human being who hears and sees what others may miss. His stories speak from the heart, with lessons both straightforward and profound. 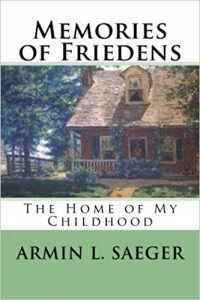 Memories of Friedens: The Home of My Childhood by Armin L. Saeger, edited by Julie Saeger Nierenberg, 2015. Saeger eloquently tells what it was like in the late 1800s and early 1900s in the German-American farming community of Friedens, Missouri, near St. Charles. The book has great family significance as well as historical and regional merit, as it preserves in wondrous detail this bygone era and the unique setting of Armin’s childhood memories. 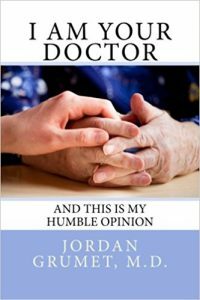 I Am Your Doctor: And This Is My Humble Opinion by Jordan Grumet, M.D., 2015. What is it like to be your primary care physician? How do day-to-day pressures, concerns and unfolding developments impact the one who looks after your health and wellbeing? What does your doctor feel about the responsibilities and nagging questions that are an integral part of every waking hour? What is it like to know that each routine decision is potentially life-altering to your care? Who cares about your future medical care? Jordan Grumet’s writing builds an insider’s level of understanding. 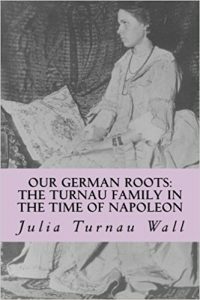 Our German Roots: The Turnau Family in the Time of Napoleon, A Memoir by Julia Turnau Wall and Julie Saeger Nierenberg, 2015. At the age of 78, Julia composed memoirs of her family’s origins, the ancestral home of Marssel near Hanover, and stories of the French, Russian and Swedish occupations of that region in the time of Napoleon. Historically intriguing and amusing tales detailing the life and times of her parents and grandparents. 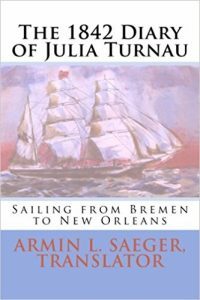 The 1842 Diary of Julia Turnau: Sailing from Bremen to New Orleans by Julia Turnau, edited by Julie Saeger Nierenberg (2013). Turnau’s diary of her nine-week voyage at sea. At 23 years of age, she immigrated to the United States to marry a young pastor. An interesting and vividly told depiction of her daily life aboard the sailing vessel. Julia wrote about her fellow passengers, the changing weather and environment, the threat of a probable pirate ship and the routines and accommodations aboard ship. 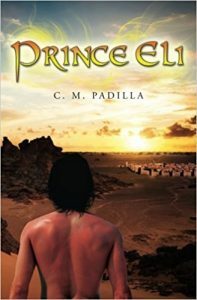 Prince Eli by C. M. Padilla, edited by Julie Saeger Nierenberg, 2013. This riveting fantasy adventure emphasizes the triumph of good over evil in a young prince’s journey of enlightenment and growth into the responsibilities of manhood. In the Empire of the Seven Kingdoms, the forces of evil test the faith of the royal bloodline. The plot revolves around young Prince Eli and his adopted brother Liam, as they journey from Paradise through many mystical lands, learning valuable lessons and skills along the way. 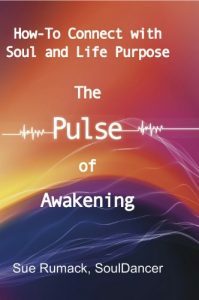 The Pulse of Awakening: How to Connect with Soul and Life Purpose (SoulDance) by Sue Rumack SoulDancer, edited by Julie Saeger Nierenberg, 2013. This how-to manual for New Age readers that takes the metaphysical jargon and mysticism out of soul connection and having one-to-one conversations with Source [God]. Real-life stories flow naturally into step-by-step tools, gently guiding you to discover your own soul mission and life purpose. 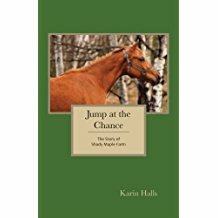 Jump at the Chance: The Story of Shady Maple Farm by Karin Halls, edited by Julie Saeger Nierenberg (2013). The heartwarming story of a young woman rising to a challenge to ride horses internationally against all odds. It contains romance, drama, family legacy and emotional ties. 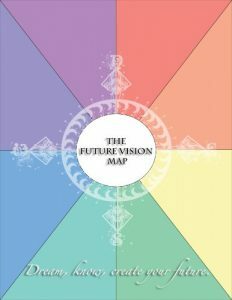 The Future Vision Map by Julie Saeger Nierenberg and Gary Evans, 2012. Designing your Vision Map in words and pictures, your dream takes form in a powerful way. Customizing and updating that visual collage, it becomes your own guiding map to the future of your desires. Whether your goals are destinations of accomplishment, of contentment or of physical locations, the map will guide you along the path to their creation. Sowing My Quaker Oats by Armin L. Saeger, Jr., illustrated by Julie Saeger Nierenberg, 2010. Insightful and heartwarming true stories from a twentieth-century life fill these pages. Oklahoma author Armin Saeger’s Quaker roots shape the man he becomes and the work he undertakes. 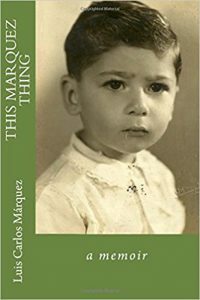 These real-life snapshots take us from early childhood, in Oklahoma and Missouri as well as Philadelphia, through WW II experiences as a Conscientious Objector, then into the author’s professional life as a social worker and psychotherapist. 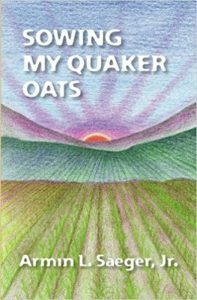 He reveals compassion, intelligence, and humor in Sowing My Quaker Oats. Experience with him the pains and joys of life, and step into history rarely heard: the Dust Bowl, the Great Depression, human guinea pig experiments with infectious hepatitis and frostbite, the civil rights movement, Native American issues in the 1960s, individual and group mental health approaches, and see the toad that jumped too far.